For not eating sugar this month I think I am doing quite well at finding yummy dessert recipes! This one really has made my month! I think this might possibly be my new favorite ice cream! 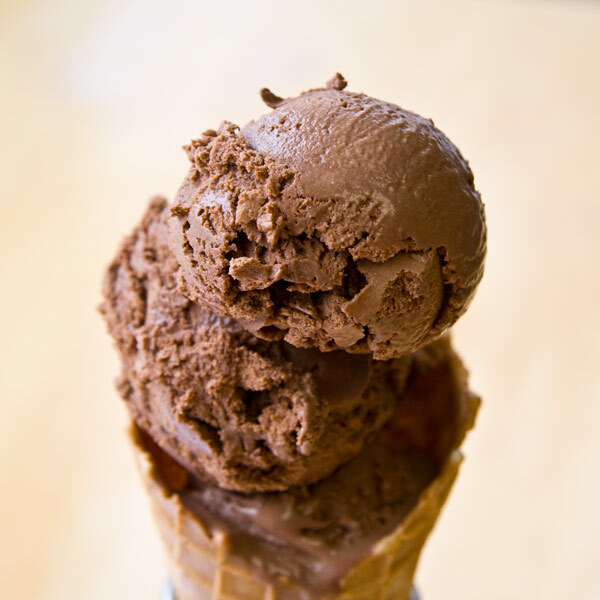 This ice cream is creamy and smooth and oh so chocolatey! You never would believe that there isn't any sugar in it! I don't care if I am eating sugar or not. This is not just an ice cream I am going to eat while I'm not eating sugar. This ice cream is going to be a regular in my ice cream making schedule (yes I do believe that ice cream should be made on a regular schedule). Since the custard is made without sugar, keep an eye on things as it will cook rather quickly. You can use a bowl set over a pan of simmering water, to avoid overcooking if you’ve never made a custard before. And because I don’t like washing dishes, I use the same saucepan for cooking the custard that I used for dissolving and blooming the cocoa powder, I simply scrape it as clean as possible and use it again for making the custard. If you’re concerned about the quantity of agave nectar here, you can reduce the amount to ½ cup (120 ml) if you wish, although it’s texture and taste is exactly right for me. I have also tried it with honey and it works just perfectly! 1. In a small saucepan, warm the agave syrup with the unsweetened chocolate over the lowest heat possible, stirring constantly, until the chocolate is melted. I have also done this step in the microwave and it worked great. Remove from heat and transfer mixtures to a large bowl. Set aside. 2. In a medium saucepan, add 1½ cups (375 ml) of the half-and-half and whisk in the cocoa powder. Cook over moderate heat until the mixture begins to bubble, then simmer for 30 seconds, whisking frequently, making sure to break up any clumps of cocoa powder. 3. Remove from heat and scrape the mixture into the bowl with the chocolate-agave mixture. Stir them together, then set a mesh strainer over the top. 4. Add the remaining half-and-half to the saucepan with a pinch of salt, turn on the heat, and when warm, slowly pour the warm half-and-half into the yolks whisking constantly, then pour the warmed yolks back into the saucepan. 5. Cook, stirring constantly over moderate heat, until the mixture becomes steamy and thickens. If using an instant-read thermometer, it should read about 170F degrees. (76C). 6. Pour the mixture through the strainer into the chocolate mixture. 8. Chill thoroughly in the refrigerator, then freeze in your ice cream maker according to the manufacturer’s instructions. *To save on eggs I have also tried this with using 3 whole eggs instead of 5 egg yolks. I felt like the taste wasn't too different and I didn't have left over egg whites. The ice cream looks lovely! This was so good! I think it's the first sugar free ice cream I have ever liked. Should have known it was a custard. Also the first time I've tried agave. I was hoping you had some trick to making it without an actual ice cream maker, since you brought it over in that bowl. durnit. gotta add that to my wish list. Why cut out sugar but substitute other sweet ingredients?